I love all the stories in the Bible about Jesus. He’s beyond incredible and perfectly represented the Father. He was and is one with the Father. 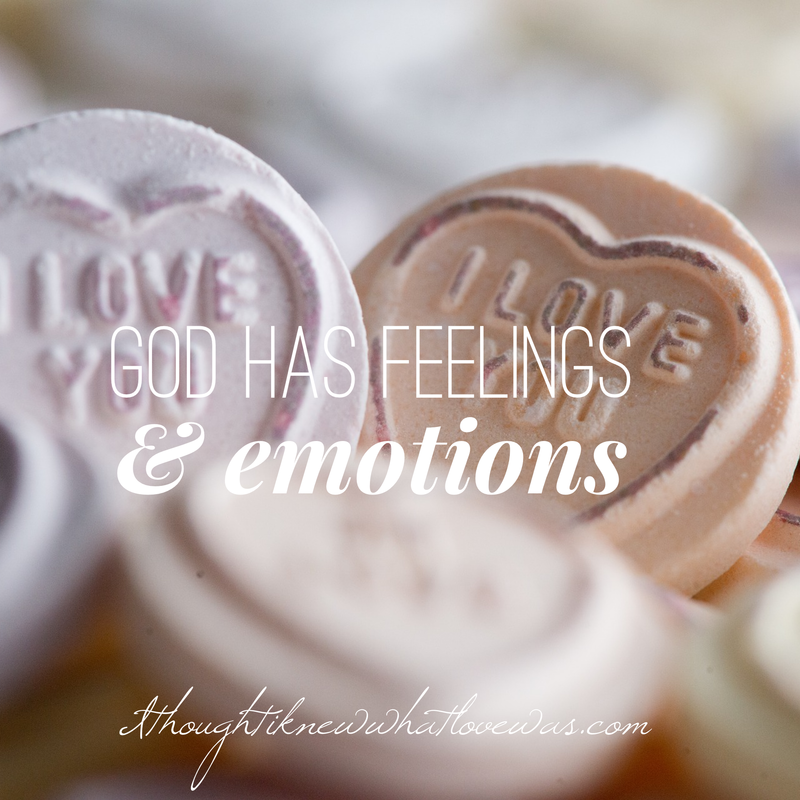 Today, I wanted to start a new series on the feelings and emotions of God. Have you ever pondered, “Does God know how I feel? Does He truly understand what’s going on in my heart and soul? Is He watching life happen from a distance?” If so, this post may encourage you. I love the story of Mary, Martha, Lazarus, and Jesus. Lazarus dies and Jesus stays where He is until Lazarus is good and dead. Have you ever felt as though God was absent and something in your life died? I have. Just note Jesus is the Resurrection & the Life. There’s no situation too challenging for God! Not one. If it’s not raised to life, there’s a reason. God is good even if we don’t understand why He allows certain things to happen. If you read the story you will see Jesus had plans all along to raise Lazarus from the dead. See John 11. I’ve read and heard so many people debate why Jesus wept when He encountered Mary and the others weeping. The scripture says, “Jesus wept.” He did not weep when He encountered Martha who was looking for an explanation. I speculate Martha was a thinker and Mary more of a feeler. Some have said He saw their suffering and it moved His heart. So, He wept because they were weeping. I believe Jesus wept because He felt their pain. You may draw your own conclusion. God is in tune with your heart, thoughts, feelings, and emotions. God has the ability to feel what you feel. He’s not like your friends or family who watch from the outside and then it moves them because of their love for you. He can actually feel in His own Spirit your suffering. Where’s my evidence? Let’s look at scripture. Isaiah 53:4 (CEB) It was certainly our sickness that He carried, and our sufferings that He bore, but we thought He afflicted, struck down by God and tormented. The Bible continues to say Jesus was moved with compassion and healed the sick. It goes on to say He knew the hearts of men. I told you in the miracle series of my friend who was suicidal and said nothing to me about it. I was joyful one moment and then grief stricken the next. She was miles away. I had not talked to her. I had to pray the sadness and grief off me. She, I found out later, had an encounter with God during the time I was praying that saved her from taking her life. I felt what she felt and it manifested in weeping, bawling actually. I felt it in my spirit. My body responded to her pain and she was nowhere near me. I’m not God, no way. His Spirit has the ability to known your pain and level of discomfort. He knows everything and not from simply watching or observing. I believe Jesus felt the pain of the people around Lazarus. I don’t believe it was simply an external observation that led to weeping. I truly believe He felt their pain. Even though He knew He was raising Lazarus from the dead, He was completely in touch with the emotions of the people around Him. God isn’t distant or out of touch. He’s more engaged than people can imagine. He’s not like us. We see, process, respond. God knows; He knows the depths of man’s sorrow and depravity. The Lord spoke something to me during a really challenging moment. He said, “Do you think I’m watching you suffer from the outside? Do you think I don’t know your pain? I know the depths of it far better than you. It’s not My desire to leave you this way.” At that moment I realized I had placed God in the human box…”He’s watching me suffer.” No, God was right in the middle of my suffering. He knew the intensity of the pain more than I did. How does this change your perspective on your circumstancs? On God? What moves you, moves His heart. I’ve written many posts on where’s God during suffering. If you wish, you can look them up with the search function on this site. God sees all and knows all including the depths of your pain, sorrow, sickness, depression, oppression, despair, fear, anxiety, hurt, heartaches, etc…I used to think it strange when I’d wake up happy then encounter someone and my emotions shift. I could feel what they felt and sometimes even the physical pain. I know now it’s a call to pray. Jesus lives to intercede for you (24/7). I’m not stating God is sick or in pain. I am stating when you are, He knows exactly how it feels. God knows everything about you down to the cellular level, brain chemistry, and hormonal level. He knows the coding of your DNA, every strand of hair on your head, every tear you’ve cried, and every memory you’ve ever had. No one is more in tune with you than God. Papa I ask that we would comprehend more fully Your great love for us and Your connection with us. Help us to know You intimately. Deepen our awareness of who You are. You’re not cold, distant, or absent. Thank You for Your great love! In Jesus powerful name, amen. Amen, thanks for the reminder. Thanks so much for your prayers sister. You are a blessing to me, and I pray that you continue to reach many in your endeavors that glorify, honor, and acknowledge God. I also wanted to echo in accord that God knows us better than we can personally fathom. He loves us beyond measure, and He also knows how difficult temptations, trials, and difficulties can be. He personally experienced beyond what any one of us will ever have to overcome, and we can say boldly that He is with us through the biggest storms of life. What an honor to be among His children, to be adopted by the King of Kings, we are heirs and co-heirs with Christ. Who are we to think we can enjoy this privilege without also sharing in His sufferings? He who sparred not His own son, how will He not also freely give us all things? We have to trust God for the temporal and the eternal. He is omnipotent, omniscient, and omnipresent. Furthermore He has never let us down, and He never will. Perfect track records speak for themselves, and God is far more than we can ever ask, think, or even imagine in our wildest dreams. He is for not against us my friend, and I count myself among those who are blessed to be able to recognize that. Thank God for ears to hear and eyes to see the truth! We are not veiled from the reality of His mercy and rich grace. God bless you Victor! You are so loved by God!!! Keeping you in my prayers. Thanks, you know I most definitely appreciate that. Likewise!